Local pro wrestling is the best value for a night out! Click an event for matches. Prices are for adults at the door. All Saint Louis events are included on the calendar. Event runtimes are low-end estimates. WWE, New Japan Pro-Wrestling, Ring of Honor, Impact Wrestling, Lucha Libre AAA Worldwide, Major League Wrestling, and out-of-market events by local promotions are excluded. 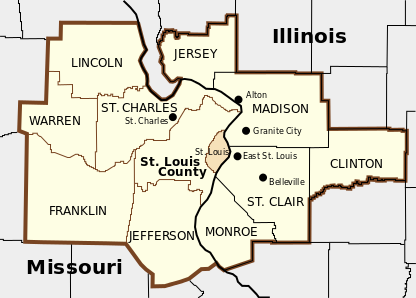 Not pictured, but included counties: St. Francois, Macoupin, Washington, Bond, and Calhoun. Match listings are by Patrick Brandmeyer. SaintLouisWrestling.com is a third-party tool that is not responsible for unforeseen or unreported changes. Think your website is great. There are a lot of amazing wrestlers in this company. Ron Powers and Jake Dirden made my son feel like a million dollars. God bless them.